Special needs kids who beat the odds give me lots of feelings. Dogs being heroes and saving the day give me lots of feelings. Put those two things together? ALL THE FEELINGS! 4 Paws for Ability is a nonprofit started by Karen Shirk, a woman who was told she was “too disabled” to have a service dog. Encouraged by a warm-hearted nurse, she got her own puppy and trained him herself. Before long, word was out that Karen could train and place service dogs with children and adults turned down by other organizations, and she had a new lease on life. 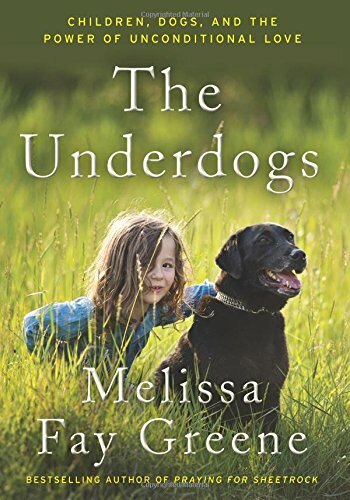 Melissa Fay Greene tells Karen’s story, as well as the stories of several families whose lives have been transformed by the addition of a 4 Paws service dog. As a former foster parent, I’ve read a decent amount about special needs kids and what life is like for them, but Greene reeeally doesn’t sugarcoat anything here. Some of the families she interviewed were in very desperate straits before gaining a canine companion. It makes for difficult reading here and there, but it also makes the hard-earned happy endings even sweeter. Greene rounds out the book with sections about animal research, exploring questions like, “Do animals feel emotion?” I could have done without these parts, personally, because as a dog owner, I have years of anecdotal evidence that yes, animals absolutely feel emotion, and feel it keenly, so I didn’t really give a hoot what some scientist somewhere said or how they constructed their experiments. All I have to do is leave the house for too long a stretch, and the pile of shredded tissues that confronts me upon my return is proof enough that my pup is lonely and wants to rebuke me for abandoning him. As far as I’m concerned, animals are more likely to have souls than some humans I know of. It surprises me not one bit that they can help special kids live their lives to the fullest.